The Scotty Cameron Newport 2 Studio Select somehow looks just right behind the ball. The version pictured here has the slightly narrower flange (area behind hitting surface) due to the wider toe and heel weights, and in that respect it is almost a total copy of the Ping Anser. Where this outshines the Anser is in the softness of the back edges. Cameron has put his magic touch in there and it makes the overall impression less clunky than, say, the Ping Redwood Anser. It sits wonderfully square and gives you a reassuring feeling of quality. Since it also has a generally square shape and prominent aim line, it's also easy to align. I've owned and used a Scotty Cameron Newport 2 Studio Select for some time, but even after that length of time it's hard to describe precisely how it feels. There's nothing negative to say about it, but I'm also left a bit underwhelmed by it. As you'd expect the feel is soft, and you certainly wouldn't feel worried to take it onto a lightning fast green, but it's just a bit dead... dare I say it unresponsive. What I will say for it, though is that you get very little feeling of weight in the toe. Excellent if you're violent with the right hand and hook your putts left. On the other side of that coin, however the lack of "toe-throw" isn't good if you're a blocker who tends to hold the putter face open too long and miss more often to the right. No quibbles here. The roll is excellent. The Scotty Cameron Newport 2 Studio Select is an affordable Cameron putter (plenty of used examples are to be found around the $100 / £70 mark). It's a good looker, and extremely functional - especially if you like very little amount of "toe-throw" (i.e. feeling of weight in the toe). If you were to offer me any Cameron putter, however, this wouldn't be at the top of my list! 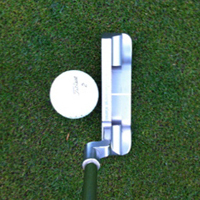 Ping Redwood Anser - Ping's answer to the Scotty Cameron range is a putter to be reckoned with. For my money it's slightly better than the Studio Select. Ping Karsten Anser - the same quality of roll and feel at about one-third of the price of an entry-level Cameron. Yes C-Groove Donna - Not quite in the same league for feel and workmanship, but that C-Groove roll takes some beating!